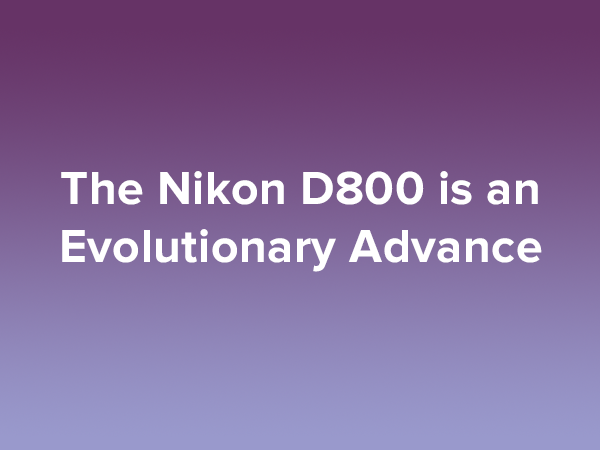 The Nikon D800 has received glowing reviews and with good reason. The D800 is not just another model Nikon camera. It is the next step in the evolution of digital photography. The 32 megapixel full frame Nikon D800 has a resolution that compares favorably to medium format cameras. A quality high resolution print size of 30 X 20 is achievable without resizing. In addition to amazing resolution, the D800 performs well with a high ISO and has an auto focus speed that blows away anything Nikon makes other than the D4. High ISO of up to 800 is achievable without noise or the need to post process it out with Photoshop. There are a few new features available in a Nikon camera for the first time with the D800. In particular, I like the four custom shooting options available in the menu which are very useful and user friendly. I also like the interval timer mode which allows in camera processing of time lapse photography. The innovations introduced with the D800 are not without the need for refinement in later models. For example, the movie record button’s location on top of the camera places the mode button too far away for those of us who shoot primarily still images. In addition, the battery life is a bit shorter on the D800 than it is on DX model cameras. However, both of these issues are minor. People should carry a spare battery anyway. Another option that was oddly omitted is the ability to bracket in two stop intervals. The D800 auto bracketing setting offers 5, 7 or 9 brackets at one stop each. It seems that with the memory demands of high megapixels that a two stop option to allow only three photos for a good HDR image should be available. One consequence of the 32 megapixel size is the difficulty of storing and post processing images, especially in camera raw. The D800 really requires a fast 64 Gig card. Any less will require that you keep extra cards in your camera bag. For those of us who process our images directly in Photoshop, the size of these images almost requires us to use Lightroom as a first step. Lightroom works with the metadata and not with the actual image so that once the images are loaded for the first time they are faster to manipulate. It very well may be that Adobe has anticipated large file sizes and that may well explain why they created Lightroom in the first place.